True, we want to have an ideal BMI. We want to look good, and feel good. We want to be wanted. We want to be - SPECIAL. But it has to start with a right mind. 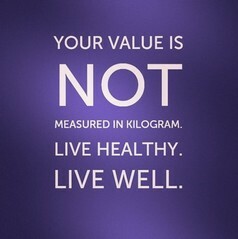 Our value is not measure in kilogram, as we can see in the scale. It is waaay beyond that. Live a healthy life. Love yourself ! Because in the darkness, even your shadow will leave you. Upgrade Your Browser For Hassle-Free Shopping! Genuine vs Counterfeit : Does It Matter?